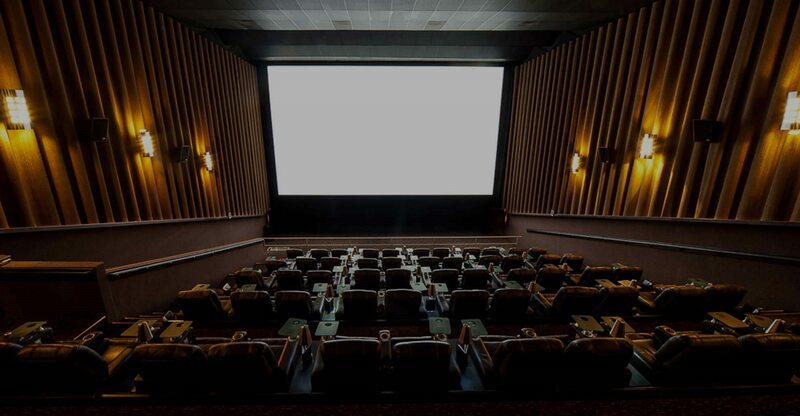 Ask even the most casual moviegoer from the city of São Paulo, Brazil what the best movie theatre in the city is and there is a good chance you’ll be directed to the Cinépolis JK Iguatemi. 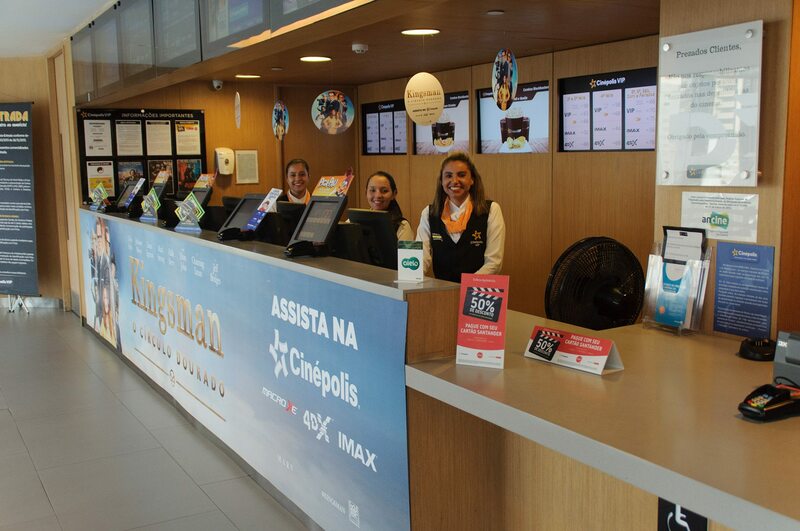 To be sure, there are any number of contenders for the title of best cinema in São Paulo, including the Cinemark Cidade Jardim just across the Pinheiros River from the Cinépolis JK Iguatemi, the new Cinesystem Morumbi Town, the Cinemark Eldorado, either of the Kinoplex sites, Itaim or Vila Olímpia, and if only for its programming, the Espaço Itaú de Cinema. 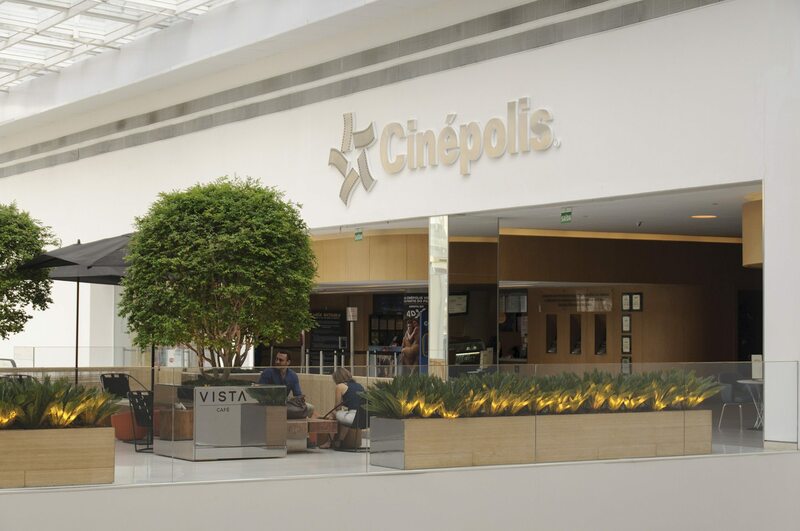 But if you really want a true taste of Brazil’s modern moviegoing experience, most Paulistanos will tell you that Cinépolis JK Iguatemi is the “whole package”. What is truly something to behold is the wrapper on that package. 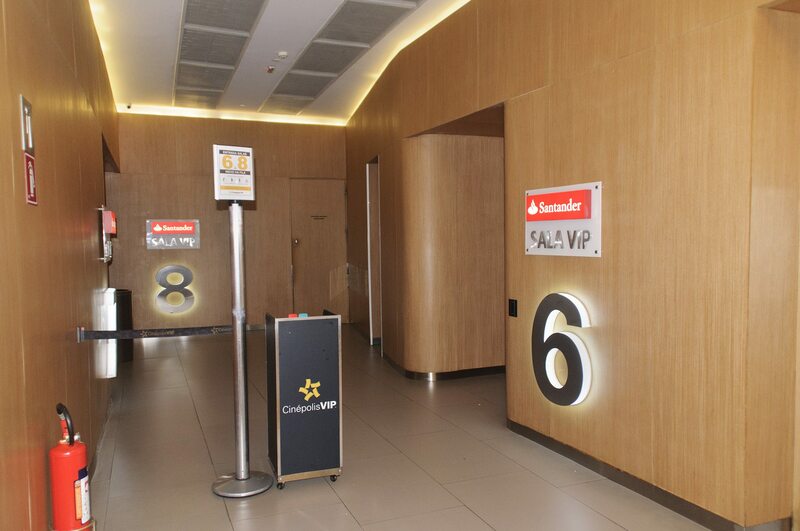 The Cinépolis JK Iguatemi is located in Shopping JK Iguatemi, the mall from which the cinema takes its name. The mall itself is named for its address on Avenida Juscelino Kubitschek, which in turn is a street named for the president that founded the country’s capital of Brasília during the 1960s. This might make clear that Brazil is a country in which names often come with a level of importance. The name Jereissati, for instance, is associated with one of the wealthiest families in Brazil, owing its fortunes to Iguatemi Empresa de Shopping Centers, a mega-mall empire. Over the last 10 years the firm has grown from 6 malls to 20, each more posh than the next. The JK, as the mall is often called, might very well be one of the company’s Crown Jewels. The mall is located adjacent to Parque do Povo (Park of the People) in Vila Olímpia, considered the “financial heart” of São Paulo, hosting the offices of international financial institutions and tech companies such as Microsoft and Google. This makes it the perfect spot for the JK Iguatemi given that nearly all of its 190 stores are occupied by the world’s top luxury brands (not to mention nine restaurants). You might be wondering why a piece that is meant to highlight a cinema is spending so much time focused on a shopping mall. That’s because in Brazil shopping malls have become big business, literally and figuratively. This is especially true for cinemas in São Paulo. A majority of the city’s movie theatres can be found in the more than 80 malls throughout the city. Stand-alone cinemas that can be accessed from the street, or “sidewalk cinemas” as they are known, are slowly vanishing. 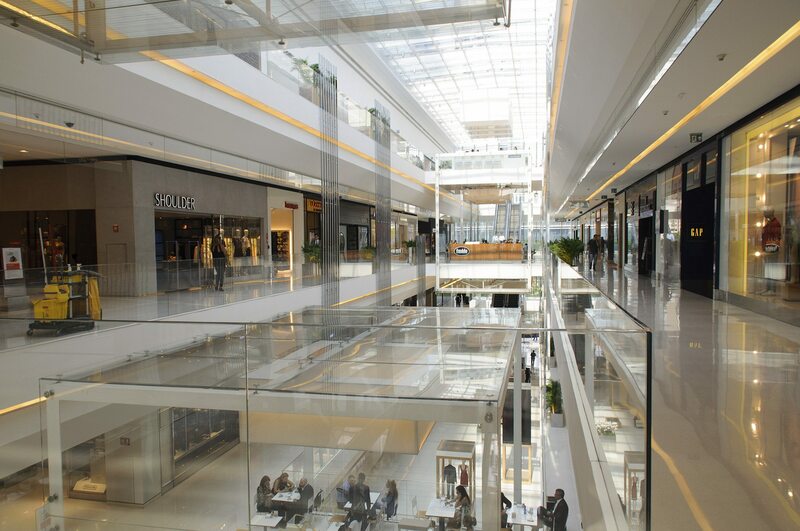 The surge in the development of malls in Brazil was driven in large part by the commodity driven economic boom which began in the last decade and lasted up until three years ago, when the country fell into a cycle of political turmoil and corruption. This has led to Brazil’s currency being devalued and an ongoing recession. Despite these circumstances malls in Brazil, and especially São Paulo, continue to be a prime destination for the city’s 12 million Paulistanos. These centres are not only setup for shopping, but also cultural events and conventions. The most popular malls incorporate a cinema to attract visitors and the JK Iguatemi is no different. Except that it is, of course, quite different, as anyone stepping through its doors quickly discovers. Part of what makes going to see a movie at the Cinépolis JK Iguatemi so memorable is the journey through the mall up to its location on the third floor. The interior of the JK is a work of art (and often serves as a gallery for actual artworks). Though indoors, a glass ceiling four stories above the large, terraced courtyards make it seem as if you are outside during daytime hours. Natural materials such as wood, stone and marble are used throughout its sleek modern design. It is no wonder why the mall has been dubbed “the temple of consumption”. The JK is so stunning and gives off such a four-star vibe you might be tempted to whip out a camera to snap a few photos. Be warned, if you do so one of the facilities dapper and omnipresent guards will swiftly appear, issuing a stern warning that no photos are to be taken. Apparently this kind of precaution is required when you have a mall filled with millions of dollars in high end jewelry. But don’t dawdle too long wandering around the JK, for the Cinépolis cinema awaits, and it too is a luxurious experience. Actually, the Cinépolis JK Iguatemi’s eight screens boast at least three moviegoing experiences through its; VIP dine-in theatres with Italian leather recliners, an IMAX and a screen with 4DX motion seats. The theatre opened in June of 2012 along with the inauguration of the mall and quickly became on of the city’s best cinemas. 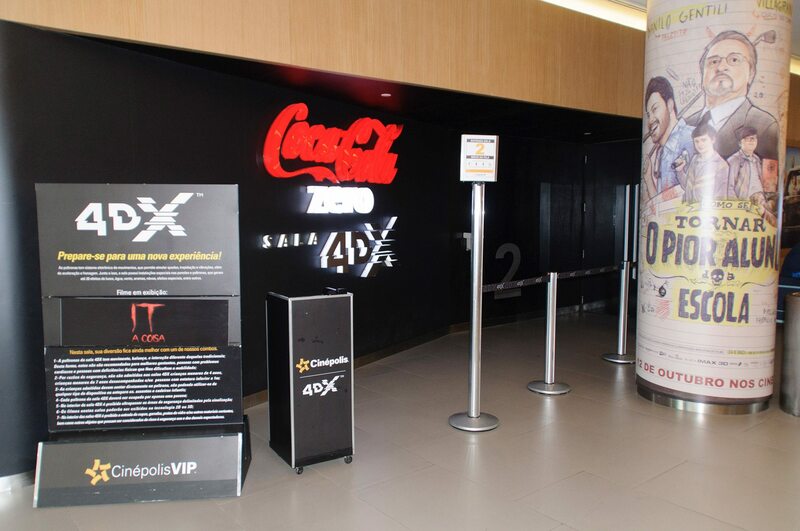 It was the chain’s third multiplex in São Paulo and 18th in Brazil. From the outside, the Cinépolis JK may first appear to look like any other cinema found in a mall. Tucked away in a corner of the JK, it’s signage is more metallic chrome and shinier than most theatre marquees so that it fits in with its upscale retailers. At night the sign a backlight accents the Cinépolis brand hanging above its wide entrance. 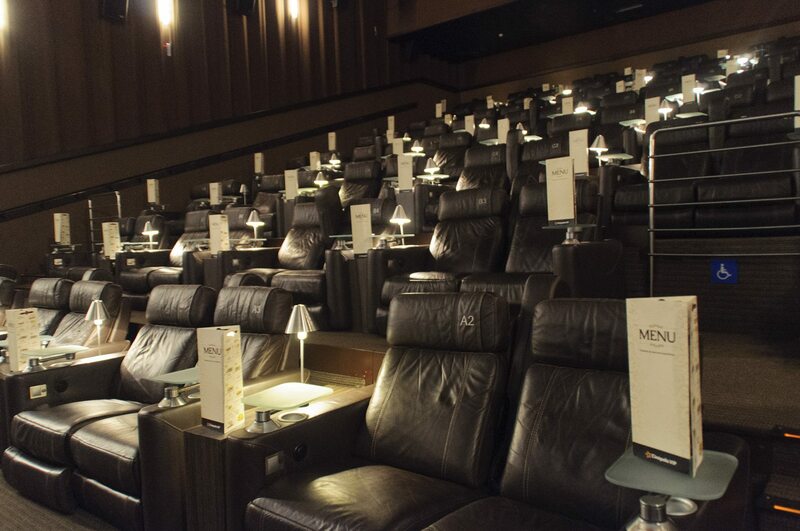 The cinema is designed in the same style and with high-end materials that match its host mall. It is laid out in the shape of a capital letter I, with the entrance at the baseline bracket, the lobby and premium format cinemas in the stem and the remaining six screens in the capline bracket. 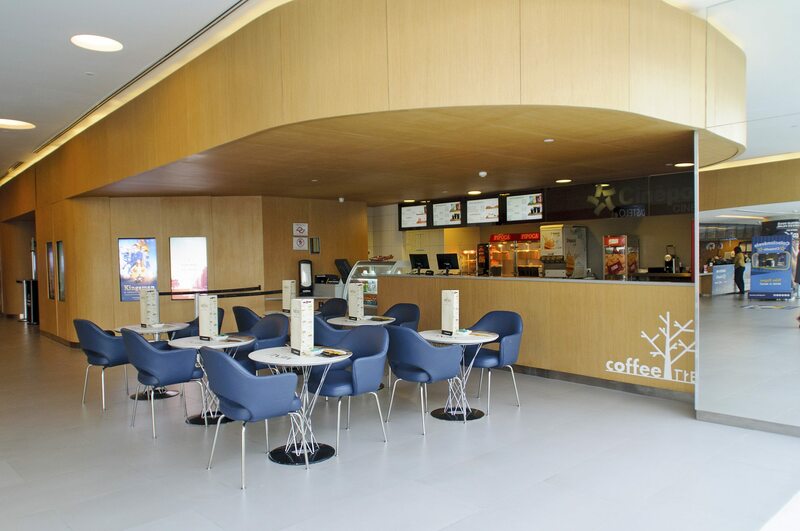 Greeting guests at the entrance of the theatre is both a box office counter with three ticketing kiosks to the left, and to the right, Coffee Tree, a cafe that serves coffee, smoothies, pastries, sandwiches, crepes and more. There are tables nearby for you to enjoy a quick bite, or walk further into the lobby past screens 1 and 2 (IMAX and 4DX respectively). When entering the lobby, a concession stand runs along the right side and a fully-stocked bar is angled along the entire left side. Both offer the same full menu of dining options found in every auditorium. The middle of the room is filled with either cafe tables and chairs near the concession stand, and some modern lounge decor near the bar. 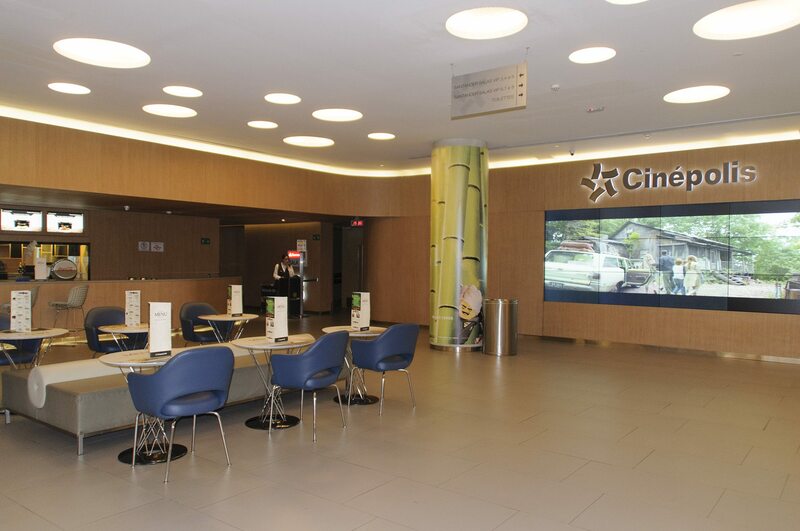 Since the cinema’s inauguration the Cinépolis JK’s lobby has hosted countless events and has become one of the go-to spots for São Paulo’s major movie premieres. You can head off straight to your screening, though we’d recommend first stopping by the bomboniére, or concession stand. 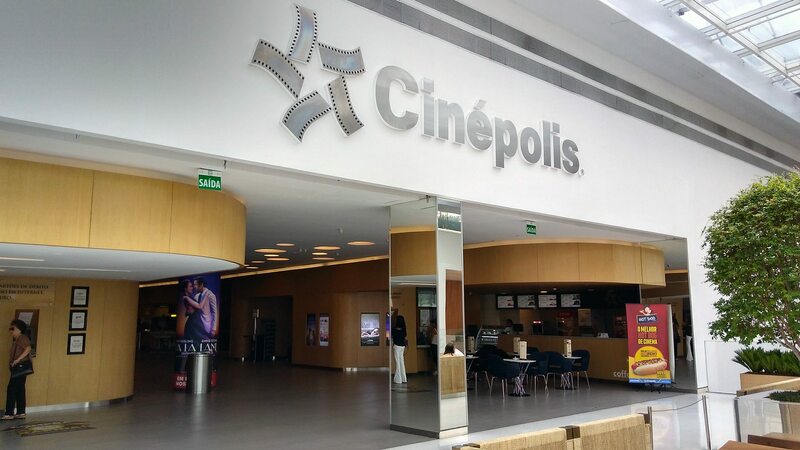 Like most cinemas throughout the world, the Cinépolis JK offers standard movie theatre snacks such as an assortment of candy, soft drinks and popcorn, but there are also nachos, hot dogs and a local delicacy known as pão de queijo, little cheese bread puffs that you won’t want to share. When it comes to popcorn, or pipoca as it is called in Portuguese, there is the usual buttery and caramel varieties, but try one of the flavored popcorns; lemon pepper, chili pepper and even banana. At first the thought of banana flavored popcorn was a non-starter, but after tasting one handful, the person accompanying us on our visit – the one on the strict diet – wound up eating the whole bag before the movie started. So much for the diet. Traditional snacks such as popcorn cost anywhere from BRL R$ 12.75 to R$ 20.75 (USD $3.85 to $6.25), with flavored popcorn a few reais more. Soda’s top out at BRL R$14 (USD $4.25) for a large. If you look closely enough, you may be able to see the hustle and bustle of a working restaurant kitchen just behind the concession stand. The chefs and their assistants all wear protective hair nets and sanitary shoe coverings as they prepare mini-cheeseburgers, smoked salmon wraps, ciabatta paninis, pizzas, Nutella crepes, and other dishes. You can order these meals from the concession stand or from wait staff in any of the auditoriums. Though none of the VIP-auditoriums are as large as the IMAX screen (378 seats) or the 4DX (248 seats), don’t let their low seat count (between 67-81) fool you. 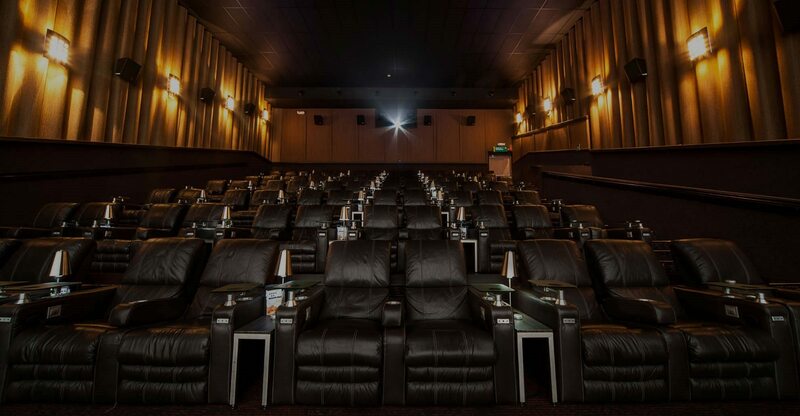 These are not small rooms with tiny screens, but rather auditoriums that could easily fit twice the audience if it weren’t for the oversize recliners provided for each patron. The recliners are paired up and each has its own dining table and cup holder. In between every set of recliners is a small lamp so you can see what you’re eating before the show begins. Trust us, you won’t want to get up from your recliner when the credits roll at the end of the movie. As for the price of food, menu items range from BRL R$ 25 (USD $7.54) for banana chips with cheddar cheese all the way up to a BRL R$ 35 (USD $10.55) for a caprese or vegetable ciabatta sandwich. Cinépolis has really thought the whole menu through because there is even a small chocolate cake for desert. All food and beverages can be ordered from wait staff who will bring it to you right in your seat either before or during a film. It’s worth noting that throughout our mid-day visit on a Tuesday the service was stellar, with attentive employees assisting us during our entire stay. 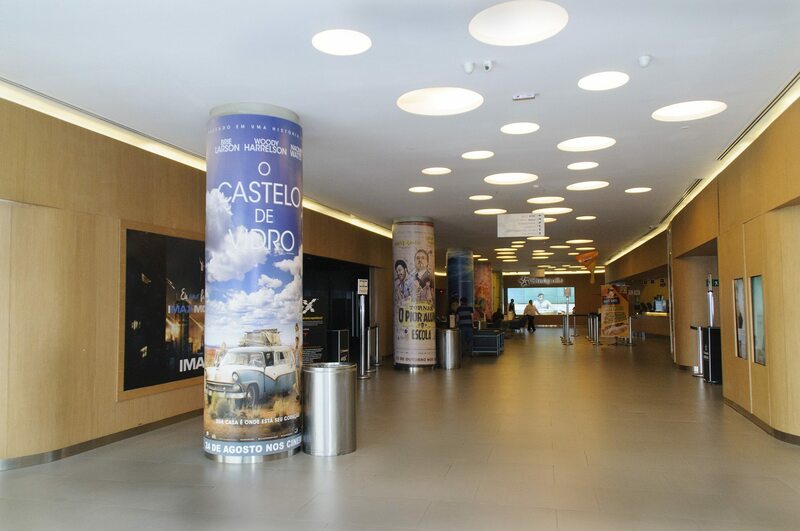 For some cinephiles, one of the benefits of seeing a movie at the Cinépolis JK is that films are shown in their original language with Portuguese subtitles. A majority of the cinemas in São Paulo, not to mention Brazil, show dubbed versions of movies. On our visit we watched the original version of “Kingsman: The Golden Circle,” or “Kingsman: O Círculo Dourado” as the movie was titled in Brazil. Digital cinema makes it easy for cinemas to swap out language tracks and add local language subtitles to any given screening and Cinépolis is wisely using the technology to help help them differentiate their theatre. Something that might not be as unique, at least in Brazil or many other parts of the world, is that, except for the IMAX screen, each of the auditoriums has a sponsor. 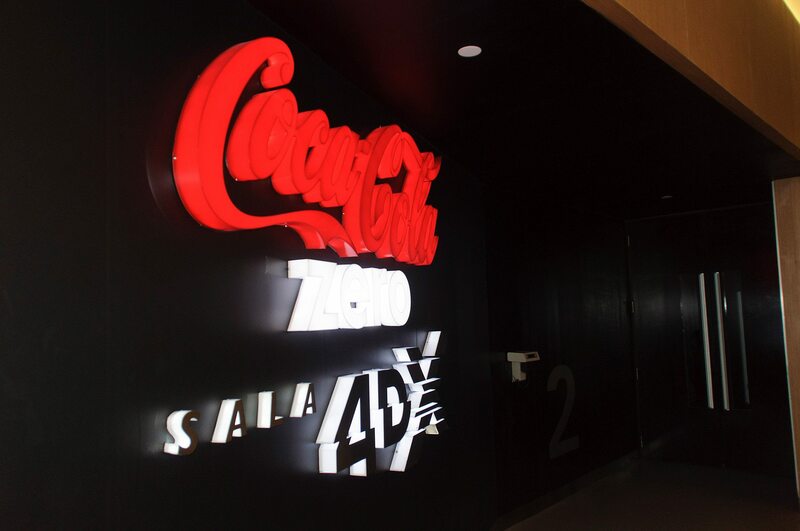 The 4DX screen is sponsored by Coca-Cola and the remaining screens by Santander Bank. 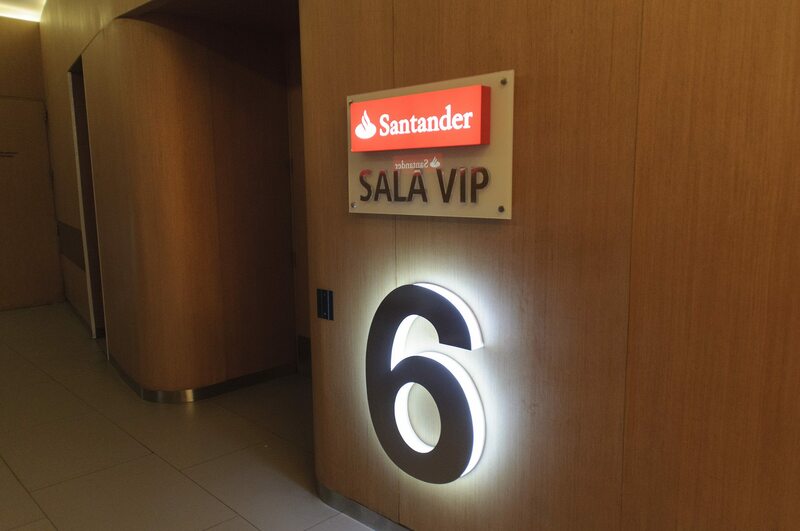 In fact, use your Santander credit card when purchasing tickets or concessions and you’ll get 50% off the price. Otherwise, regular admission costs between BRL R $ 41 to R $ 78 (USD $12.35 to $23.50) for 2D films and BRL R $ 49 to R $ 78 (USD $14.80 to $23.50) for 3D, IMAX and 4D screenings, making it one of the most expensive cinemas in São Paulo. But then, keep in mind, rent at the temple of consumption surely doesn’t come cheap and Cinépolis is providing a luxury cinema-going experience in one of the largest cities in the world.